On Thursday 6th December, Ealing Friends of the Earth and Southall Transition presented: ‘A Plastic Ocean’ (100 minutes, 2017). ‘A Plastic Ocean’ begins when journalist Craig Leeson, searching for the elusive blue whale, discovers plastic waste in what should be pristine ocean. In this adventure documentary, Craig teams up with free diver Tanya Streeter and an international team of scientists and researchers. They travel to twenty locations around the world over the next four years to explore the fragile state of our oceans, uncovering alarming truths about plastic pollution and exploring potential solutions. Admission and refreshments are free, with donations welcome. David Attenborough took us through the Big Blue and its vastness in this new series. From the plants and wildlife living in oceans and by the oceans, he uncovered new species, the synchronicity of the food chains and the impact of human behaviour on those. Despite its mind blowing beauty, the fragility of nature is shown, and we were reminded of the 8 million tons of plastic washed off each year. Bringing to mind how our daily consumption of plastic products impacts our world and the need for changing our habits as shoppers. EVERY single piece of plastic that has been created since the 19th century is still SOMEWHERE on our planet. So if it never goes away, where does it go? The invention of synthetic plastics created an era of disposable products. Watertight and endlessly malleable, plastic is the perfect invention, yet its miraculous durability is also its curse because it never goes away. In the early 21st century, rumours about an island of rubbish somewhere in the Pacific Ocean, started to rise. TV host and film maker Angela Sun, decided to investigate. Her journey takes her thousands of miles from human civilization. There, in what should be a remote tropical paradise, she discovers an ecosystem inundated by plastic waste. Exposed to seawater and sunlight, tonnes of discarded plastics are breaking down into smaller fragments resembling food to fish and birds. The images Angela uncovers, combined with evidence from researchers, shows that the truth behind the myth is much worse than imagined. A growing toxic confetti is transforming the oceans and is also working its way up the food chain that humans depend on. Angela returns from Midway with even more questions. She seeks out scientists and health experts who reveal that chemicals in many of the plastic products we take for granted are harmful. This film is suitable for all audiences. Run time: 57 minutes. This abbreviated version of the popular and influential Crash Course video lecture presents the eye-opening and ground breaking research of the longer work in a dynamic format. The Crash Course explores the predicament of our economic system’s requirement for growth as it encounters the limits of the environmental and energy resources of our planet. The film provides an unflinching but uplifting look at the issues that define our moment in history, and the opportunities we have to reshape our world based on a new vision of prosperity. Colin Bevan aka the ‘No Impact Man’ is on a mission. In this film the Bevan family embark upon a year long experiment in extreme green living. That means no TV, electricity, driving, taxis, buses, processed food, disposable razors, packaged products and more. Instead the year involves a great deal of recycling, composting, walking, cycling, candles, food growing and on and on. Watch this film to see Just how far this Manhattan family can go in the quest to reduce their environmental impact and save the planet without driving each other crazy. Could oil free agriculture be the future of farming? This is the question posed by this BBC documentary film. In 2007 wildlife film maker Rebecca Hosking succeeded in getting plastic bags banned from her hometown of Modbury. 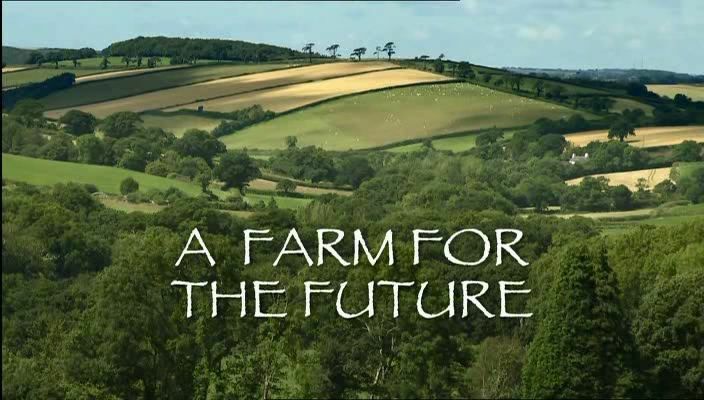 In ‘A Farm for the Future’ she returns to her family farm in Devon and discovers that the traditional methods employed by her father may not be the most energy efficient, sustainable or even productive. Hosking examines our reliance on oil and oil by-products in the world of agriculture and brings into question the viability of continuing along the path of fossil fuel dependent food production. The film takes a look at the traditional systems of commercial agriculture and compares them to newer non-destructive, low-energy innovations that are more closely aligned with natural principles. The audience is introduced to the design science known as permaculture and the concept of food forests. Working examples are used to demonstrate how such methods can be applied to help tackle issues such as peak oil and soil erosion. This film was last screened on 27th August 2015. Planting trees for fuel, food and timber is not something that anyone would imagine as the first step toward winning the Nobel Peace Prize. Yet with that simple act Wangari Maathai of Kenya started down the path that helped to reclaim her country’s land from a century of deforestation while providing new sources of livelihood to rural communities. She gave previously impoverished and marginalized women the tools to participate for the first time in the political processes of their communities and the growing movement to end Kenya’s twenty-four-year dictatorship. Taking Root weaves a compelling and dramatic narrative of one woman’s personal journey in the context of the turbulent political and environmental history of her country. Wangari Maathai was born and raised in the rural highlands of Kenya. She went to University in the United States during the 1960s civil rights era, and was the first female to receive a doctorate in East and Central Africa. Maathai discovered the core of her life’s work by reconnecting with the rural women with whom she had grown up. They told her that their daily lives had become intolerable: they were walking longer distances for firewood, clean water had become scarce, the soil was washing down hills in their fields, and their children were malnourished. “Well, why not plant trees?” Maathai thought to herself. Trees provide shade, prevent soil erosion, supply firewood, building materials, and produce nutritious fruit. With this realization Maathai founded the Green Belt Movement, a grassroots organization encouraging rural women and families to plant trees in community groups. A seemingly innocuous idea, Maathai soon discovered that tree planting had a ripple effect of empowering change. In the mid 1980s, Kenya was under the repressive regime of Daniel arap Moi under whose dictatorship group gatherings and the right of association were outlawed. In tending their nurseries, women had a legitimate reason to gather outside their homes and discuss the roots of their problems. These grassroots women soon found themselves working successively against deforestation, poverty, ignorance, embedded economic interests, and political oppression. They became a national political force. As the trees and the Green Belt Movement grew, a spirit of hope and confidence also grew in ordinary citizens – especially amongst rural women – only to be met with violent opposition from the government. Maathai and her colleagues soon bore the brunt of President Moi’s political oppression. In response, Maathai’s political activism only grew. At great risk she lead numerous confrontations in defense of the environment and social justice, all of which brought her country closer to democracy. Through TV footage, newspaper headlines, and chilling first person accounts, Taking Root documents these dramatic confrontations of the 1980s and 1990s and captures Maathai’s infectious determination and unwavering courage. Kenya’s fight for democracy finally prevailed. In 2002, a new democratically elected coalition government replaced Moi, and Maathai became a member of the new Parliament and Assistant Minister of the Environment and Natural Resources. The trees continue to grow. Today there are more than 6,000 Green Belt nurseries throughout Kenya that generate income for 150,000 people, and thirty-five million trees have dramatically altered the physical and social landscape in various regions of the country. The Green Belt Movement has also started programs teaching women about indigenous food crops, income generating activities, HIV/AIDS, and self-empowerment. Cinema verité footage of the tree nurseries and the women and children who tend them brings to life the confidence and joy of people working to improve their own lives while also ensuring the future and vitality of their land. Taking Root makes clear that Britain’s quest for resources and its systematic oppression of the diverse ethnic communities resulted in massive deforestation and disconnected Kenyans from their land and from themselves, creating long-standing issues over unequal resource distribution and social unrest that exist to this day. At heart, Maathai’s work is about solving these social and environmental issues by getting to the root of this deep wound. Through intimate conversations with Maathai, whose warm, powerful, and luminous presence imbues much of the film, Taking Root captures a world-view in which nothing is perceived as impossible. 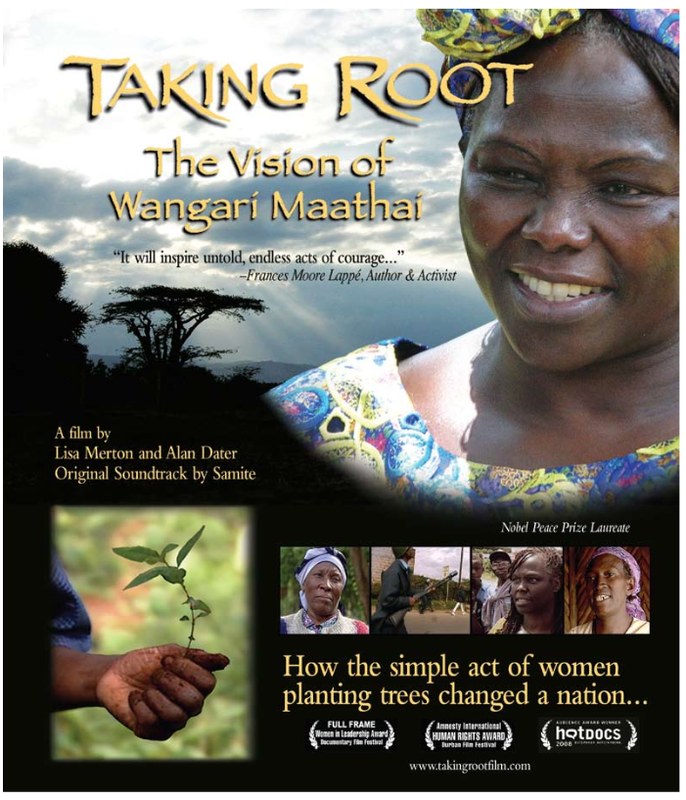 The film presents an awe-inspiring profile of one woman’s thirty-year journey of courage to protect the environment, ensure equality between women and men, defend human rights, and promote democracy–all sprouting from the achievable act of planting trees. Taking Root was produced and directed by Alan Dater and Lisa Merton. In December 2014 we took a brief break from screening documentaries with this animated comedy that changes everything you thought you knew about bees! Barry the Bee wants more out of life than the inevitable career that awaits him and every other worker – making honey. When he shockingly discovers that anyone can purchase honey right off the shop shelf, he realizes that his true calling is to stop this injustice and set the world right by suing the human race for stealing the bees’ precious honey. ‘Bee Movie’ is a mainstream animated film, with an important message, that the whole family can enjoy. The screening included fun bee facts, a quiz and popcorn! St John’s Church, Havelock Rd, Southall, UB2 4DH. Emmy award winning film maker Robert Kenner explores the food industry and learns the true cost of cheap food. Although this documentary focuses on the US market, many of the issues highlighted are not unique to the States. The film reveals how much of the food supply is now controlled by a handful of mammoth corporations that often put profit ahead of consumer health, the livelihood of farmers, the safety of workers and the environment. 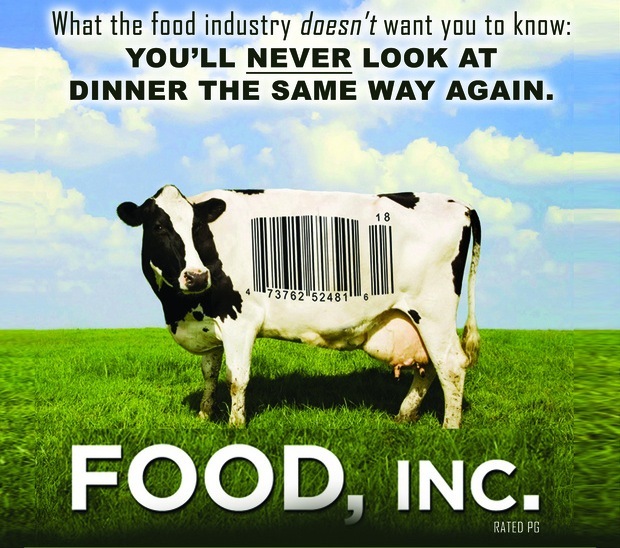 ‘Food Inc’ is rated PG and contains footage shot inside large-scale animal processing plants which some viewers may find unsettling. It is an excellent yet disturbing look at the food industry that might make you question how your food got to your plate. We have a problem with Stuff. We use too much, too much of it is toxic and we don’t share it very well. But that’s not the way things have to be. Together, we can build a society based on better not more, sharing not selfishness, community not division. 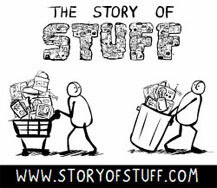 The Story of Stuff is a short animated documentary about the life cycle of material goods. The documentary is critical of excessive consumerism and promotes sustainability. This film was screened as a part of the ‘Story of Stuff’ event on Thursday 16th October 2014. The focus of the night was to help people to generate less waste & also save money. In addition to the movie there were up-cycling demos, discussion, free food & drink, & more besides. There were even some ‘goodies’ given away. The Dominion Centre, 112 The Green, Southall UB2 4BQ. Doors opened at 7.30PM. Jeremy Irons stands on a beach beside the ancient Lebanese city of Sidon. Above him towers a mountain of rubbish-a pullulating eyesore of medical waste, household trash, toxic fluids and dead animals-the result of thirty years of consumption by just one small city out of how many in the world? As the day’s new consignments are tipped on top, debris tumbles off the side and into the blue of the Mediterranean. Surrounded by a vast reach of plastic bottles, a forlorn Jeremy Irons stares at the horizon. “Appalling,” he mutters. This film examin es a fundamental element of modern culture…the disposal of what our society defines as “waste.” It is an issue influenced by every consumer, most of whom never consider the consequences. Nor, it seems, the implications to our biosphere. At times humorous, but deeply poignant, “Trashed” examines the waste stream fast approaching a half billion tons annually. What are the effects all this waste will have on already strained natural resources? Why is so much of it produced? Who is affected most? And who wants us to make more? The film analyzes the causes and effects of the seemingly innocuous act of “taking out the garbage” while showcasing the individuals, activists,corporate and advocacy groups working to affect change and reform the current model. 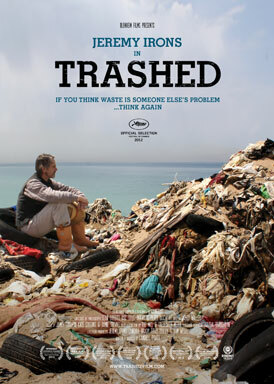 “Trashed” is an informative and thought-provoking film everyone interested in the future of sustainability should see. Trashed was screened at 7pm on Saturday 13th September 2014 at St George’s Community Centre, Lancaster Road, Southall UB1 1NP. In July ‘The Economics of Happiness’ was screened, enabling those who attended to learn about a world moving simultaneously in two opposing directions. As governments and big business continue to push for ‘growth’ in the form of increased global trade, there is an increase in climate chaos, senseless war, fundamentalism, financial volatility, income inequality and the consolidation of corporate power. At the same time, people around the world are resisting these policies, demanding a re-regulation of both trade and finance. Far from the old institutions of power, communities are coming together to re-build more human-scale, ecological economies based on a new paradigm – an economics of localization. After the screening, people were encouraged to discuss their responses to the film in small groups. A discussion was then held with everybody, enabling people to share their thoughts about the film’s message and its relevance to Southall. We’re grateful to St John’s Church in Southall Green for hosting the event. When the Soviet Union collapsed in 1990, Cuba’s economy went into a tailspin. With imports of oil cut by more than half – and food by 80 percent – people were desperate. 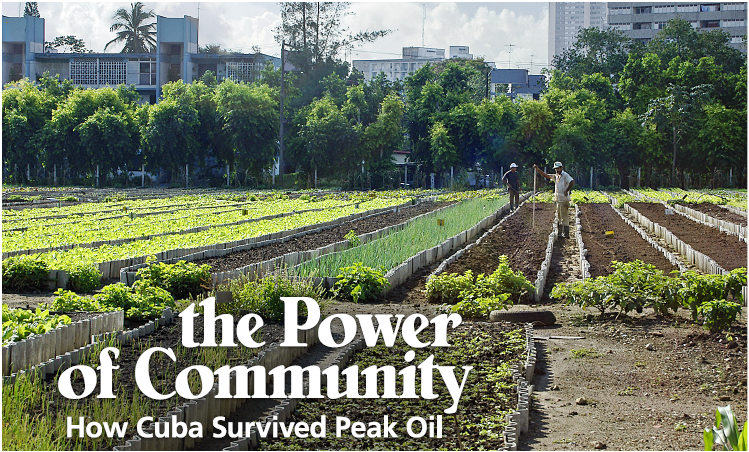 The Power of Community tells of the hardships and struggles as well as the community and creativity of the Cuban people. They share how they transitioned from highly mechanized agriculture to using organic farming and urban gardens. It is an unusual look into the Cuban culture during this economic crisis. The film opens with a short history of Peak Oil, a term for the time when world oil production will reach its all-time peak and begin to decline forever. Cuba, the only country that has faced such a crisis, is an example of options and hope. This film was screened on Friday 9th May 2014 at Holy Trinity Church, High Street, Southall, UB1 3HH and Thursday 30 April 2015, 7pm at St John’s Community Hall, Havelock Rd, Southall UB2 4DH.